A few weeks ago, we announced our sync with Withings scales. This partnership allows data collected from your Withings scale to be integrated and analyzed in your SportTracks health metrics. Read on for directions to get your Withings connection set up. Mouse over your profile pic and click my account. 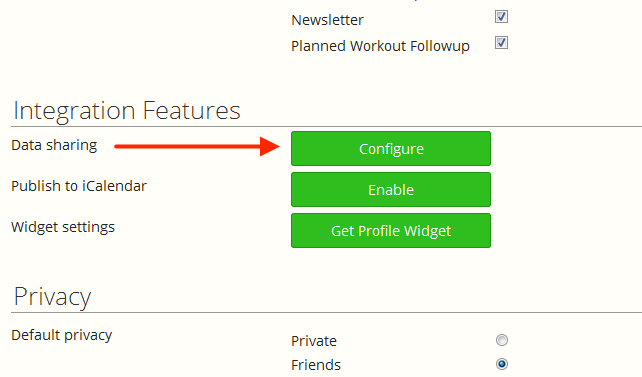 Scroll down to integration pictures and click Configure data sharing button. You will be directed to a page titled "Sharing." Click the Connect button. 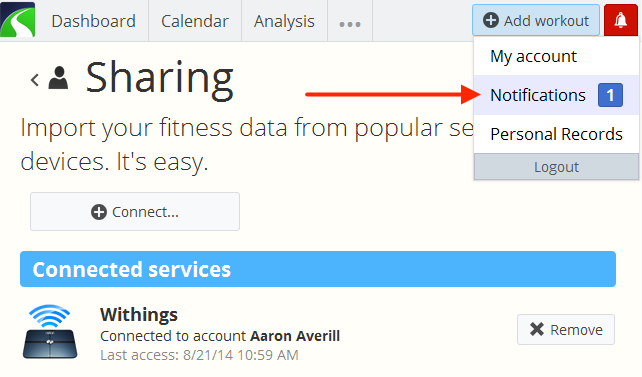 Click the Withings button under the "Select Services" window. Sign into your Withings account. You will be taken to an authorization page. Enter the appropriate user name in the form and click Allow to permit the sync. Click the Finish button in the popup window. You will now see Withings listed under your connected services. You will receive a message in your notifications that the Withings sync was approved. Need additional help? Email support@sporttracks.mobi for more direction. Will this weight data sync back to my desktop SportTracks 3? Hey Dave! The Withings data syncs over the web through SportTracks.mobi. 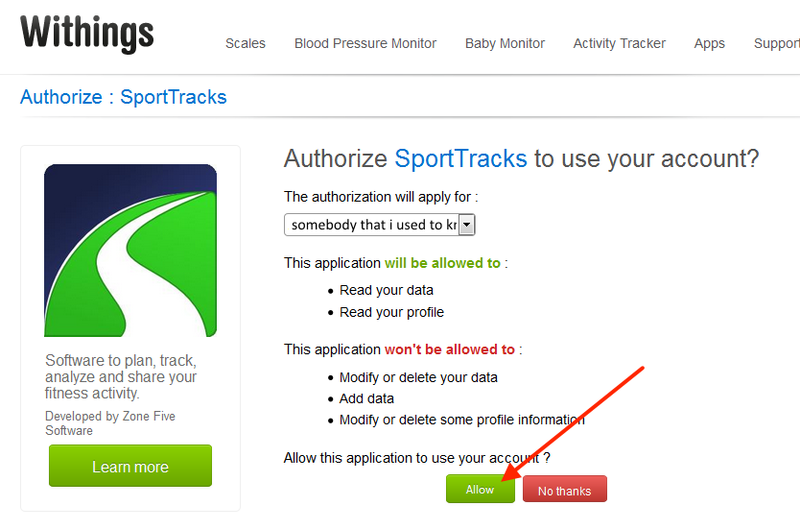 If you are a pro user, meaning you have both a mobi and a SportTracks 3 account, that data will also sync to your SportTracks 3 account. and do you think will you integrate Tanita BC 1000 device to import our wealth features ? will this data be sync to sport tracks or this feature is for data from the weight scale only? Will this snyc be an instantaneous one or just once a day? And what about blood pressure und Pulse values? Can't These daraus be Synode, too? Just connected (and depressed to see my fat percentage 2 points higher than when measured with my previous manual scales... but hey - now it's automated, which is still excellent. I'm also interested to understand if you're thinking about sync for other withings products (blood pressure etc); or perhaps to offer the ability to optionally capture HR to resting heart rate. 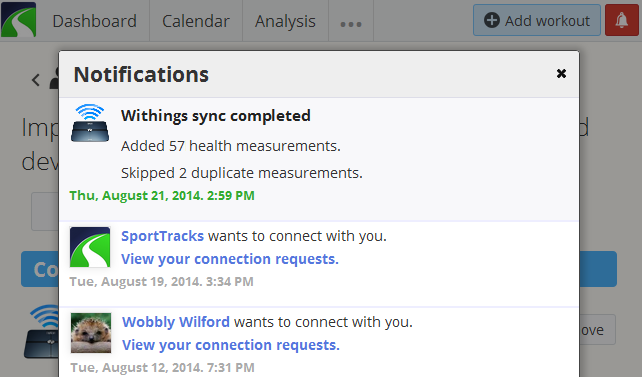 Would also be great to be able to sync historic data from sporttracks back into withings. I am very much interested in transferring blood pressure data from withings as well. I connected my withings account with sporttracks but it doesn't sync the BMI data. It only sync wheight and fat percentage. Why it doesn't work well? Do you plan the enhancement to sync resting HR from Withings Health Mate to SportTracks.mobi? I already connect my Withings scale to my SoprtTracks account, however is sync only the first time it is connected. After several days still is presenting same data as before ( no new data after first sync). I removed it and re-connected them, same behavior. Do I need to force the sync manually in some way? or should it occurred (periodically) in automatic? I get the same thing. Only syncs when it Is first connected and then doesn't automatically check for updated information. I have went through both websites and there is nothing to trigger this to happen. Please help.